Multicomponent: Controls palette – How can we help you today? The Controls palette is a simple menu that contains controls for a specific component that you are editing. It is an easy way to add or remove data series, columns, rows, mini-charts, or ranges depending on which component is selected. You can also use the Component tree to work with sub-components. For more information about the Component tree, see the Klip Editor. 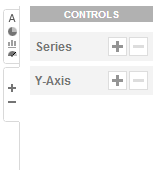 In the event that the Controls palette is not displayed, click + on the tab located at the top right of the Klip Editor workspace, under the Save and Exit button.